Amid the backdrop of an increasingly eco-conscious Singapore, the National Parks Board (NParks) will for the first time be leasing out garden space in its parks for anyone to grow their own plants. These 2.5 sq m plots each cost $57 a year, for up to three years. Users can grow any plants of their choice, from blooms to vegetables. 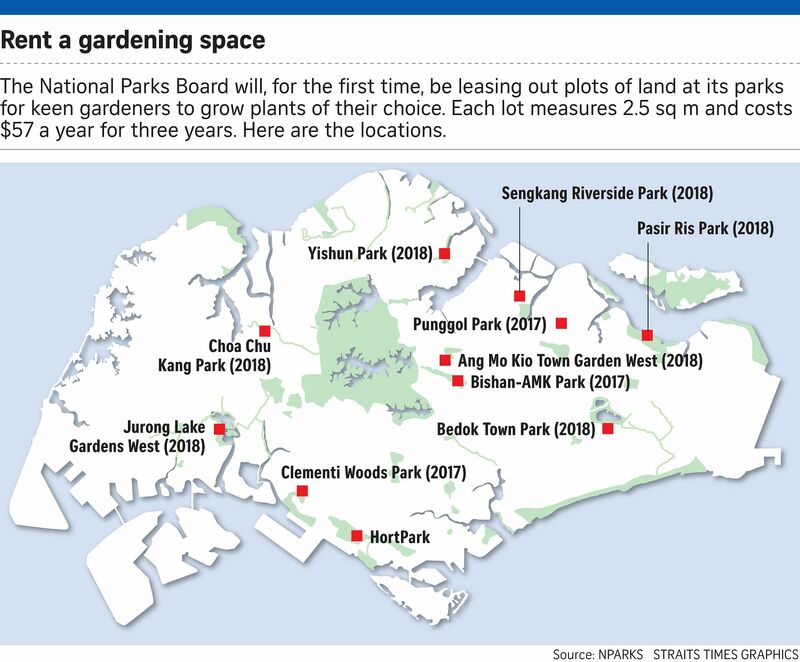 NParks aims to build 1,000 of these "allotment gardens" in 10 parks by 2019. This move is part of a broader Edible Horticulture Plan launched yesterday that trains and supports gardeners in Singapore. In recent years, more community gardens have sprouted islandwide, reflecting a keen interest in gardening beyond the professional sphere. Gardening enthusiasts also say that they have observed more aspiring green fingers. Mr Desmond Lee, Minister for Social and Family Development, noted that gardens have sprung up not only in residential estates, but also in schools, and even indoors. And residents love the idea of growing their own food, as about 80 per cent of community gardeners under NParks' Community In Bloom (CIB) programme raise edibles in their shared plots, said Mr Lee, who is also Second Minister for National Development. Mr Lee was speaking yesterday at the launch of the second Community Garden Festival, which runs until tomorrow at HortPark, off Alexandra Road. In a pilot allotment scheme last year, 80 allotment plots that were made available in HortPark were quickly snapped up. By the year end, new allotment gardens will be available for rent at Punggol, Clementi Woods and Bishan-Ang Mo Kio parks. Applications can be made during the festival at the Allotment Garden Booth in HortPark. NParks provides the basics: a raised garden plot at waist level, soil and water. The gardeners simply have to bring their own seeds and tools. Mrs Emily Fong, a retiree in her 60s, enjoys having her own 2.5 sq m space in HortPark, right next to her niece's. She said: "There's a sense of ownership. It's a bit hard in the shared community gardens to determine what you own." NParks said there are now over 1,300 community garden groups. As part of the Edible Horticulture Plan, it aims to enhance training schemes. The new three-tiered scheme has a basic training level, an advanced level for ornamental plants, edibles and pollinator-attracting plants, and a final CIB ambassador level to groom a new generation of expert gardeners who can train others. These new initiatives bank on the widespread interest in gardening, and create a community effort to achieve the City in a Garden vision, NParks said. Hundreds of people turned up for the festival, attending talks and tours, buying plants at their retail marketplace, and more. "I'm impressed with the gardens (on display)," said 47-year-old housewife Rosna Hamde, who turned up with her nine-year-old son Rafael Afiq. "I came for the tours and talks, and maybe I'll go for the cooking demonstrations too."